Darrick Wood Infant and Nursery School is committed to safeguarding and promoting the welfare of children and young people and expects all staff and volunteers to share this commitment. Mr B Broughton is the E-Safety Co-ordinator for Darrick Wood Infant and Nursery School. www.thinkuknow.co.uk CEOP’s website aims to offer “the latest information on the sites you like to visit, mobiles and new technology. You can find out what’s good, what’s not and what you can do about it. If you look after young people there’s an area for you too – with resources you can use in the classroom, at home or just to get with it. Most importantly, there’s also a place which anyone can use to report if they feel uncomfortable or worried about someone they are chatting to online.” This information is brought to you by the team at the Child Exploitation and Online Protection (CEOP) Centre. Our e-Safety Policy has been written by the school, following government guidance. The e-Safety Policy and its implementation will be reviewed annually. Why Internet use is important? The Internet is an essential element in 21st century life for education, business and social interaction. The school has a duty to provide students with quality Internet access as part of their learning experience. 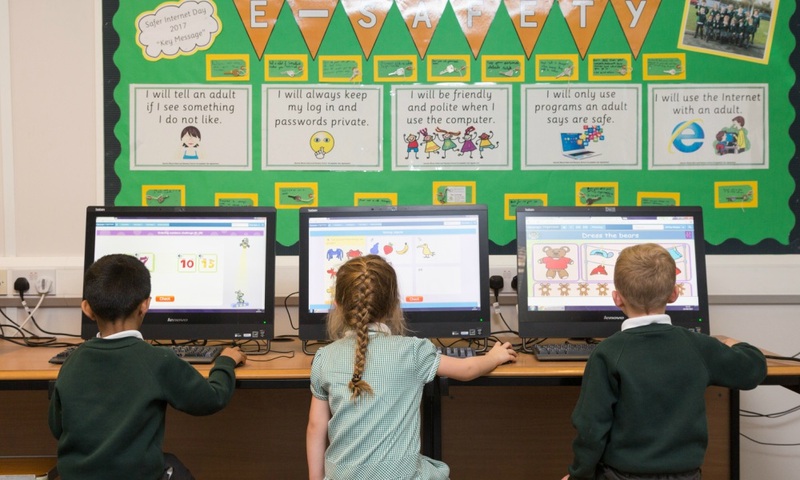 Internet use is a part of the statutory curriculum and a necessary tool for staff and pupils. Virus protection will be updated regularly. All internet access will be subject to filtering from Bromley LA. Security strategies will be discussed with Bromley LA. The contact details on the Web site should be the school address, e-mail and telephone number. Staff or pupils’ personal information will not be published. The school will block/filter access to social networking sites. Pupils will not have the opportunity to give out personal details of any kind, which may identify them or their location. Pupils and parents will be advised that the use of social network spaces outside school is inappropriate for primary aged pupils. Staff are advised to not link with past or present pupils on social networking sites. Action will be taken against anyone using social networking sites or any other media who deliberately defames or maliciously and inappropriately perpetuates falsehoods or brings the academy into disrepute. Staff are not permitted to use their own cameras or mobile phone cameras for pictures of children. In school staff should use school cameras and download the pictures onto the school system. On school trips senior leaders are to be made aware of any pictures being taken by others on the trip. The school will work with the LA, DCSF and the Internet Service Provider to ensure systems to protect pupils are reviewed and improved. Senior staff will ensure that regular checks are made to ensure that the filtering methods selected are appropriate, effective and reasonable; this is carried out in partnership with Bromley LA. Personal e-mails and text messages are not a suitable way to communicate with pupils and parents. Staff are discouraged from communication with parents or pupils using personal e-mail accounts or by text message. All school e-mails are to be sent using Parentmail or the Admin e-mail account in the school office. Parents will sign a home school agreement when joining the school. This will allow children to use the internet when supervised during lesson times. The school will take all reasonable precautions to ensure that users access only appropriate material. However, due to the international scale and linked nature of Internet content, it is not possible to guarantee that unsuitable material will never appear on a school computer. Neither the school nor Bromley LA can accept liability for the material accessed, or any consequences of Internet access. The school will audit ICT provision to establish if the e-safety policy is adequate and that its implementation is effective. Complaints of Internet misuse will be dealt with by a senior member of staff. The E-Safety Co-ordinator will log and monitor any e-safety incidents. Any complaint about staff misuse must be referred to the Headteacher or the E-Safety Co-ordinator. If any concerns arise pupils and parents should inform the school immediately. Introducing the e-safety policy to pupils E-safety rules will be posted in all networked rooms and discussed with the pupils at the start of each year. Pupils will be informed that network and Internet use will be monitored. Staff should be aware that Internet traffic can be monitored and traced to the individual user. Discretion and professional conduct is essential. Failure to comply in any way with this policy will be considered a serious risk to health & safety and all incidents of non-compliance will be investigated by the Headteacher or the E-Safety Co-ordinator.